Criss-crossing metal bars protect grimy windows. On the glass, the words Burritos, Tortas, Tacos, Combination Plate! are stenciled in neon colors. Touted as one of the best taquerias in Orange County by OC Weekly's Gustavo Arellano, fellow blogger Diamond Dog and others, this is Carnitas Los Reyes in Orange. But the joint wouldn't be out of place in a dusty border town. After I stepped inside, I half expected "El Mariachi" to breeze in after me, toting a guitar case and a wink. The menu -- scribbled with markers on whiteboards precariously hung above the counter -- features buche, lengua, and al pastor variations on everything from tacos, to tortas, and quesadillas. A faded mural depicted an idyllic ranch scene, but the room I stood in was as hot as the Sonoran Desert. This was because it shared the same boxy space as the kitchen. The heat from the glowing red bulbs of the radiative lamps, the bubbling deep fryers, and the sizzling griddles kept every square inch at one constant temperature: hovering somewhere between ninety degrees and hell. But despite the sweaty workspace, the gentleman who took my order was surprisingly upbeat without a trace of fatigue. He was just as old as I was, but much happier and jollier than I would have been if I had just pulled an eight-hour shift in that sweat-box of a room. I asked for some carnitas tacos, but he informed me that it'll be another twenty minutes before the next batch is ready. "Two al pastor tacos then," I said. "Everything on it?" he grinned. Another guy, whom I will call "The Assembler," prepared my order. With a cleaver, he hacked hunks of pork into tiny pieces, and spooned fistfuls of the meat, some onions, and cilantro with one hand and onto the other, where two warm tortillas were waiting. He moved at whiplash speed and with the same deft movement of a master sushi chef. In a blur, after stuffing each taco, he rolled the tortilla into a tube, tucking one side into the other, and then wrapped it in paper and foil. My take-out order included a paper sack crammed with chips, a cup of fresh-milled salsa for scooping, and some pickled carrots balled up in Reynolds Wrap. Each overstuffed taco sold for an insane price of one buck. The Al Pastor Taco, which is described as "BBQ Pork", is composed of chunky bits of roasted pork, marinated in a caustic brew of spices. Although not as spicy or rich as other al pastor tacos I've had, it still did its duty as a full-fledged and authentic taco, especially after a few hits of El Tapatio. I only needed two of these obese pouches to quench my hunger, where usually it would take five. Next visit, I'll be trying their namesake carnitas, and the chorizo, which Senor Arellano describes as "cooked in oil that looks and feels like transmission fluid but tastes like a thousand spicy hogs." crap, I cant believe they ran out of Carnitas. Thats like going to In-N-Out and they are out of hamburgers. You have to try it. Did you like the Mexican Cowboys pained on velvet? Unfortunately you did not get the FULL EFFECT as some times pigeons walk into the restaurant! Then you really feel like you are in Mexico! If you go across the street and North a little, the menudo place "Bahia" is on your left at Chapman. You still need to try Steer Inn & get the fillets wrapped in Bacon. Its the taco truck with tons of people lining up. You gotta try it. I am thinking of starting my blog up again...what does everyone think? I'm officially on the quest to find more al pastor in OC. The best one I've tasted so far is from Tacos Jalisco #2 in Bellflower. My god. So perfect in every way. Pigeons eh? That would've definitely been a nice add-on to the ambience. That taco truck looks like its right up my alley. Thanks for the heads up. BTW, I for one would love to see you start up your blog again! Sorry to interject Elmo - But DD, we're eagerly waiting! We've missed you, man! What an authentic experience! And praise the good man above for sizeable portions! But I admit, I am a little wary of that which "feels like transmission fluid but tastes like a thousand spicy hogs." I see that you too have known the spicy love of al pastor. Gotta love Mexican food with Middle Eastern flair. Aren't we the lucky ones with all this great stuff around?!?... Let's all go out to eat again!!!! When I went, I waited like, forever. I used to go to this place in Fontana that was comparable. I heard that Taco Ando is wonderful. Just up the street. But, I agree with diamond dog; Bahia. I go there regularly. It's a mexican seafood place and their ceviche is custom made to your specifications. I had the fish taco's the other night and it was a wonderful surprise. Freshly, lightly breaded fish on corn tortillas with a spicy creamy and tangy sauce. Just wonderful. Haven't had their carnitas tacos yet. I keep going back for seafood. Thanks for the tip on Boiling Crab. I've mapped that out as a place to try while visiting in California. We'll be playing Garden Grove HS on Wed, so we'll definitely stop by. What else?? 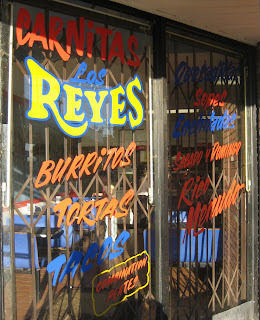 Love Mexican food, so we will definitely try Carnita Los Reyes. How about sushi? I've written down the Sushi Shibucho. I heard Sprinkles cupcakes were good. If you check my blog (havent updated in a while) there is a review of Uoko sushi. That chef (Tomo) is now at Kingyo Sushi. You can see some of his work on my blog. This is a one of the leading sushi places in OC and they bring in a ton of stuff from Japan. Great ambiance in the restaurant, cool chefs and a really cool regular clientele that frequents the place. The owner U Kim is such a nice guy. They have a very very extensive sake collection and use the same buyer as Tsunami in San Fran which is known for rare sakes. Kingyo Sushi is located on the corner of San Jaucquin Rd and Newport Coast in the Pavillions shopping center. Other stores that are there are Dogma, First Class Pizza & Sharkeys. I am expecting a review from Elmo pretty son. Be sure and tell Tomo and U Kim Fred sent you guys there! Now I want some street tacos. You and CP are hitting up all the Mexican restaurants for me. BTW, I've had al pastor tacos at numerous places. Me too. And less afraid that it "feels" like transmission fluid rather than "tastes" like it. Al pastor is "Al Awesome". That made no sense, but you know what I mean. Totally! Would love to. BTW, I'm going to try Franco's next week! What's his best dish? Luckily, I was only one of a few people that were in there when I went. Bahia sounds just like the thing for Lenten Fridays! Carnitas Los Reyes is grungy, so be warned. Also, Sushi Shibucho is a tiny, tiny place and a bit too austere for teens. But it's great if you're really into sushi! I'd suggest Kura Sushi in Costa Mesa if you like Kaiten Sushi (although you've probably had better sushi in Hawaii)...fun for teens though. Also check out Honda Ya in Tustin. Awesome Japanese pub (great food). I did a review on them. As far as omiyage, hmmmmm...that's a good question. I'm tempted to say Downtown Disney, but they gouge you there. I know when I was in Hawaii, I bought all my souvenirs from Walmart. Good luck, and let me know if you need any more pointers! I think a review on Kingyo Sushi should be your inaugural post to mark your return!!! 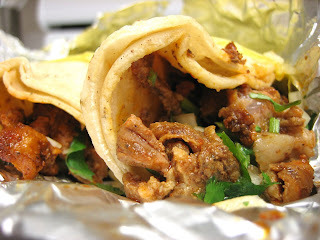 What's your favorite al pastor in OC? Good question. One I kind of want to try again is at La Rana in Aliso Viejo. It seemed to have a little bit of a sweetness to it that really punched up and rounded out the taste. Looks yummy! BTW, there is a relatively new breakfast/lunch place in Laguna Hills called Break of Dawn Restaurant. It's owned by a former executive Sous Chef from the Ritz down in Dana Point. I just had the biscuits and gravy this morning, and it's yum yum yummy. Check it out. Hey Elmo, I tried out some of your recommendations on a visit back to Orange County. Sushi Shibucho was awesome advice. On a Thursday lunch, it was just me and my aunt at the counter. After making some boxes, we had the elder all to ourselves. Pretty pleased with the awesome sushi. Very personal/attentive service. Sushi 5 was a bit of a disappointment. We would have just paid more at Shibucho for better sushi and service. Tried Bangkok Taste for the first time. My mom thinks it's better than Thai Nakorn. Judging only on prices, I agree. Your trip was pure Mexican goodness through and through. I love those places and if you ever get to Phoenix, I am so taking you to Phoenix Ranch Market where the huge mega grocery store has a wonderful food court with street tacos, tortas and fresh horchata. Then, we go for a cheese crisp. Great review, Elmo... as usual. Thanks for the tip! Didn't think there was anything good Mexican-wise south of Tustin. I've been wanting to try Break of Dawn ever since that heart-tugging article came out in the OC Register about the man who started it. But man, it's always crowded! I'll try again soon. Thanks for reporting back! Glad you got to sit in front of the master. Sorry you didn't like Sushi 5 though. It is kind of a step down after Shibucho. Should've warned you that anything after Shibucho is going to pale and wilt by comparison. I'm going to take you up on your offer -- sounds like my kind of place! Street tacos, horchata! And of course, I'll make room for the cheese crisp. Hey Elmo! I just wanted to thank you for this post. Ever since my boyfriend has moved out of San Diego, he has been missing the great mexican food there. Now that I've introduced him to Los Reyes, he has been more interested in driving out here to get carnitas than to see me. ^^; It's a good thing that I like the food there too. Wow, it pleased someone from SD! That means it definitely passes muster! Thanks for reporting back. You are doing God's work in there! Keep at it, and thank you! I like to go to this restaurant because it's a typical one, and also the owner makes a lot of jokes while everybody is eating I had never seen a place like that.